Brita Tryggvi, a Tuckee Donner Land Trust Board Memebr and docent helped lead the hike through Lower Carpenter Valley on Satuday. 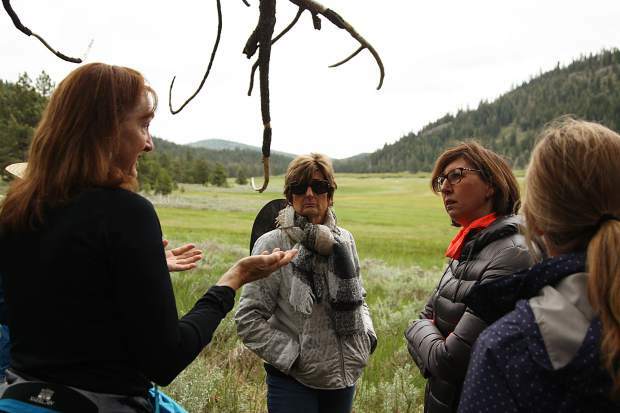 A total of 18 guests and 4 docents explored the Lower Carpenter Valley on Saturday, the first time the public has been on the property since the Truckee Donner Land Trust acquired the land last year. Patricia Kiehl, an agriculture instructtor at Sierra College and docent on the hike, explained the ecology of the area to guests Carolyn Sconza and Julie Cater. 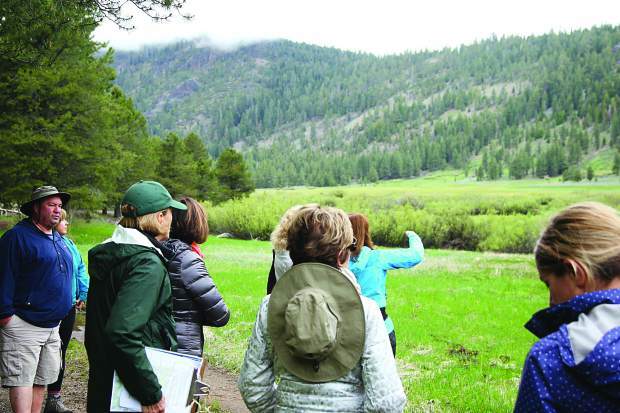 The Truckee Donner Land Trust kicked off their summer hiking series on Saturday with a docent led hike around Lower Carpenter Valley, the first time the public has been able to explore the region since the trust acquired the property last year. Located about 10 minutes north of Truckee, it’s not hard for visitors to feel fairly isolated after driving two miles on a dirt road through thick forests. The day hike welcomed 18 guests, locals and visitors to Truckee, along with four docents. Along the 5-mile trail around the valley the group stopped periodically to enjoy the panoramic views of Prosser Creek winding its way through lush green meadows. 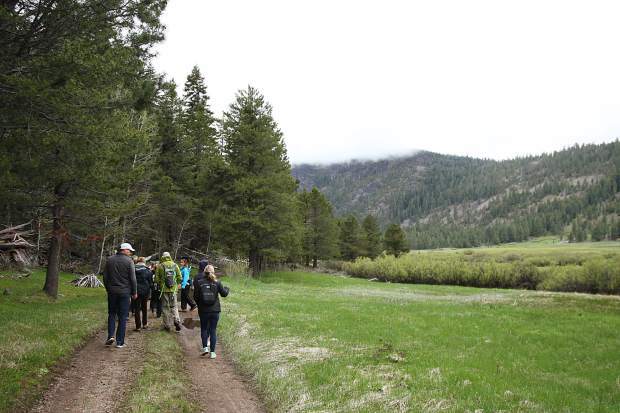 “When they see the land it’s a whole lot different than just reading about it, people are a lot more prone to conservation,” said Brita Tryggvi, Truckee Donner Land Trust Board Member and docent on the hike. Tryggvi said that the valley has been extremely well preserved and with an abundance of wildlife and blossoming wildflowers in the spring. 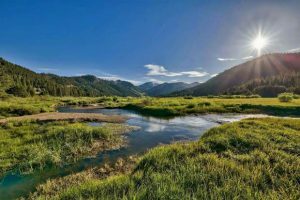 The Land Trust has purchased 1,320 acres in north Truckee which includes a large portion of the valley. 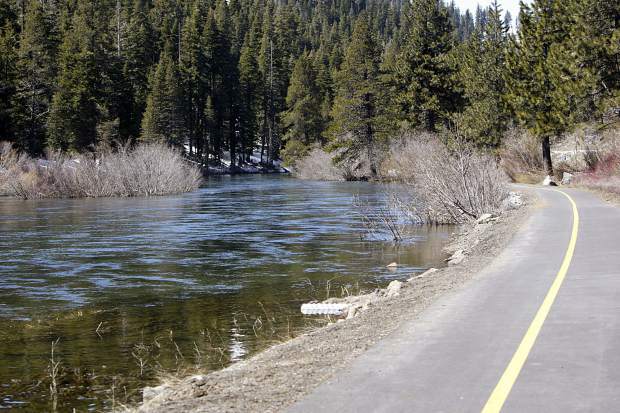 The group is currently working with the Nature conservancy and the Tahoe Donner Association to develop plans for new trails, interpretive signage, benches and picnic tables. Construction should begin in 2019 and go into 2020, at which time the property will be fully open to the public, according to the organization’s website. At this time the property can only be accessed through docent led hikes. The trust hopes to create viewing areas and trails that will allow the public to enjoy the land without impacting water flow or the natural function of the environment. They have also proposed an elevated platform at the western end of the property to provide views of the Sierra Crest and lower valley. 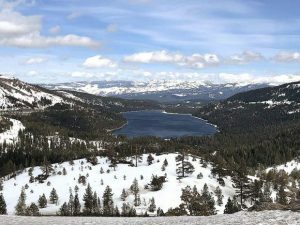 Saturday’s hike marked the first in a long series of guided hikes on Truckee Donner Land Trust property that will take place throughout the summer. While the public can only access the Lower Carpenter Valley though docent-led hikes, the trust will be offering 24 additional hikes through the valley all summer through October. Other offered hikes range from family-friendly, easy hikes through Perazzo and Lacey Meadows, to a strenuous climb up Mount Lola, the highest peak in Nevada County.